New Portal Gun Vinyl Key Chain Portal 2 Crowded Coop W/ Tag Official toy gift 3"
Never submit an order that is not entirely correct. PERFECT GIFT: Sure to make a great gift for any Portal fan. You should always be careful with giving your information on the internet. So who are we?. Portal 2 Companion Cube Plush Valve Lord Gaben. Condition is Used. Smoke free home. Shipped with USPS First Class Package. Pinny Arcade PAX West 2016 Valve Portal 2 Pin Set Companion Cube GLaDOS Wheatley. Condition is New. Shipped with USPS First Class Package. Condition is Used. I have enjoyed keeping this show piece, but I have no more room for it. I'd love to pass it on to another Portal fan! Great gift for Portal fans. Includes one cube gift box. You should always be careful with giving your information on the internet. So who are we?. We buy all our products direct from the manufacturer. New ListingAperture Science Mannequin Model Fem001-1 Fembot Robot Poster EXTREMELY RARE!!!! From 2011. It does have a small tiny little wrinkled on the bottom but no tears or anything like that. You could probably iron it out. Warning bulky pocket if using this with keys! 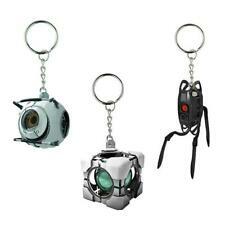 Portal 2: Refracting Box Vinyl Key Chain. Manufacturer: A Crowded Coop. For Ages 15 . Item contains small parts and functional sharp points. Portal 2: Sentry Plush Turret With Sounds by Think Geek. Motion-Activated Sound and light Light. Used but in excellent Condition. Shipped with USPS Priority Mail. It runs on 3 AA batteries, not included. You've got Atlas and P-body but best of all there's cake. 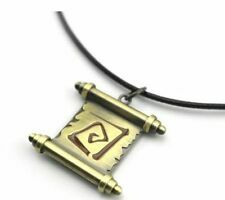 This item is NOT a gift. It can hold down switches while also holding your coffee! The future truly is great. Double walled ceramic. PORTAL! Companion Cube Inflatable Ottoman -- Bad Box but Never Inflated! 2 out of 5 stars - PORTAL! Companion Cube Inflatable Ottoman -- Bad Box but Never Inflated! 1 product rating1 product ratings - PORTAL! Companion Cube Inflatable Ottoman -- Bad Box but Never Inflated! Portal 2 Blind Box Series 1 Sunburst (closed) . Condition is Used. Shipped with USPS First Class Package. 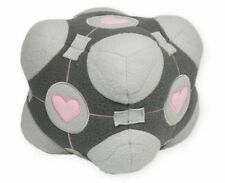 Official plush of the companion cube from Portal. Adult owned and in excellent condition. Includes one keychain. You should always be careful with giving your information on the internet. So who are we?. We buy all our products direct from the manufacturer. Never submit an order that is not entirely correct. Rick’s Portal Gun from Rick and Morty. Lights and sounds. Batteries included. Portal 2 Blind Box Series 1 Leopard Camo (closed) . Condition is Used. Shipped with USPS First Class Package. NECA Aperture Science HANDHELD PORTAL GUN WITH CUSTOMIZABLE KIT (STICKERS NEVER USED & YELLOW AND BLUE STRIPES)- COLLECTIBLE & RARE ! Portal Gun has been on display and rarely used . "tested & working sounds & lights, as seen in photos with the changing blue/orange/red/purple lights". A Nerd Block Exclusive. The cake is a lie. Never submit an order that is not entirely correct. You should always be careful with giving your information on the internet. So who are we?. We buy all our products direct from the manufacturer. NECA P-Body , Atlas Portal Gun 1:1 Scale Replica (2012). Condition is New. I bought it checked the contents then set it on a shelf. Shipped with USPS Priority Mail. ThinkGeek Portal 2 Sentry Turret LED Flashlight - Batteries Not Included. Condition is New. Shipped with USPS Priority Mail. Due to age there maybe minor creasing around the corners of the ad, etc. have minor defects. I try to point. Three portals. Regular Skylanders, Giants and Swap Force. Brand new, still wrapped in original plastic packaging, limited edition collectors portal critters, companion cube plush toy. NECA Aperture HANDHELD PORTAL GUN WITH CUSTOMIZABLE KIT-COLLECTIBLE & VERY RARE. Condition is Used. Comes with everything shown in photo, no stickers or box. That's right, the Cave Johnson Talking Portrait actually talks! The Cave Johnson Talking Portrait is the perfect addition to any scientific facility, office, or bedroom. Really, where. 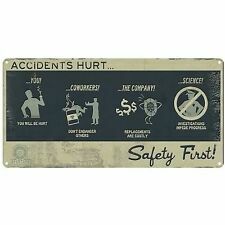 Cave Johnson was a brilliant man with a thrilling vision of the future. Portal Button Pins Set Of 4. Condition is New. Shipped with USPS Parcel Select Ground. 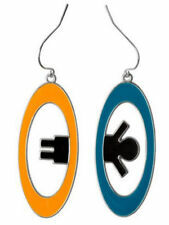 Perfect for fans of Portal ! This is the customizable version of NECA's Portal Gun Replica. Gaming Heads. Gaming Heads is proud to kick off the new Portal 2 statue line beginning with the standard model Aperture Sentry Turret. Skylanders Giants "Trigger Happy Portal Action" Plush with Lights & Sounds. Tested and Works perfectly! Great shape with minimal signs of use! He says many different character phrases such as "No Gold, No Glory!" and his guns light up in different ways with gun noises. You can tap his head button to activate him or the Mini Portal is Interactive, activating Trigger Happy's lights and sounds each time you press it. The Portal also lights up blue. It will go into Sleep mode...to wake, tap his head button again. On/Off/Try Me Switch on battery case...battery compartment is clean. I just replaced the batteries for the Portal as they're the LR44 button batteries, but I don't know how long they will last. Trigger needs 2AA batteries, not included. Please see pics! Measures about 12" tall. As a token of our appreciation, we've created this double-sided keychain to remind you to always be thinking with portals. Portal 2 Magnets Set - Set of 4 - Brand New - Cake?